Over the past many months, there have been many athletes here at CFA, in Santa Cruz and in Colorado all doing the Russian Pull-Up Progression that Coach Georgia implemented with great success and posted about long ago. We’ve written about the progression and the success athletes are having with it numerous times. What is important to note is the fact that every athlete who has benefited from following progression are tenaciously following it. It doesn’t matter how good a program is if you don’t have the tenacity to see it through. Furthermore, you’ll never be able to determine it’s value. What is important is consistently working towards the goals you are trying to achieve, just as the CrossFit Verve athletes, Danielle D. and Sarah S., that I wrote about while in Colorado are consistently working drills to improve their muscle-ups. Speaking of muscle-ups, Coach Lauren has applied the Russian progression to her ring-dips as well as her pull-ups in an effort to build more strength for aiding in her ability to achieve her first Muscle-Up. In just a couple weeks her Ring-Dips went from zero reps unassisted to two unassisted with great depth and extension. A couple weeks later, and she now has four reps unassisted, no bands, and with great depth and extension. Walking into the gym one day I saw her working her Russian progression ring-dips. Just as Danielle and Sarah were implementing a clever way to practice their muscle-up transitions, Lauren was implementing a clever new modification for band-assisted ring-dips, (pictured above), by anchoring the band to the bar above rather than the rings, and securing the band around her shoulders. 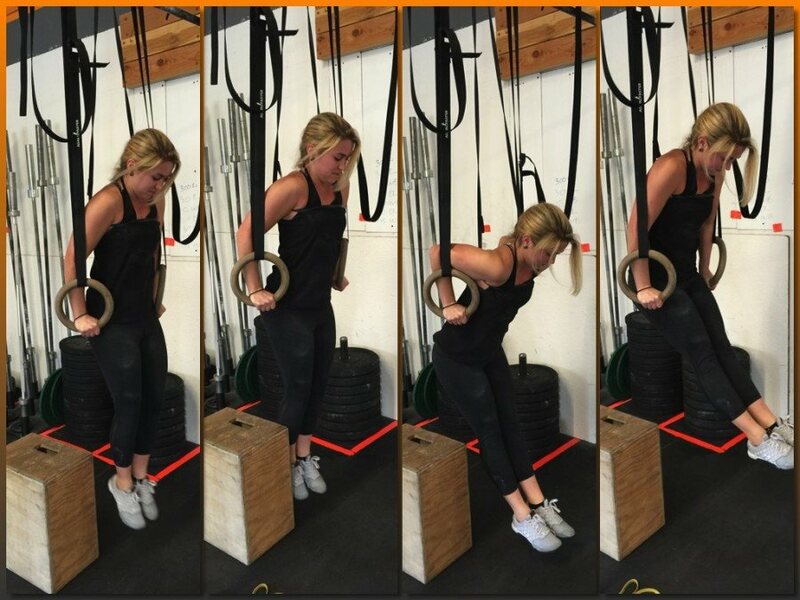 This modification still allows her to develop her strength in the ring-dip just as anchoring a band to the rings, but it can be an arguably better method because it also allows her the freedom of movement in the lower extremities to also effectively work on her “dip-kip”, something I will be writing about in a future post. Being able to work on her dip-kip with a band assist removes some of the loading in the dip and makes it easier to work on effective dip-kip mechanics. If you are one of the many athletes who have been consistently working on their dips, you might want to give this one a try.